By a show of hands, how many people get excited for a 10+ hour international flight? Just my wife and I? Oh, weird… After splurging on Singapore’s amazing first class, you’ll understand why my wife and I are obsessed with long international flights. When we picked Japan for our third honeymoon destination and secured our AA business flights to get us there, we knew that we wanted to fly home on Singapore. Being avid followers of The Points Guy, we knew that flying Singapore’s A380 First Class Suite would be one of the most luxurious in-flight experiences. So, we created a KrisFlyer account, transferred the exact amount of miles we would need for the redemption from Chase Ultimate Rewards and started putting some seats on hold. *You must have the correct amount of mileage in your account before you can start holding or booking anything. OTM tip: After making a Kris Flyer account and putting desired dates on hold, give Singapore Airlines a call. Although it took about 25-30 requests we were finally able to have the revenue team release our dates for our award flight. Also, it doesn’t hurt to tell them it’s your honeymoon. People love making honeymoons special! Note: once you transfer your points to a partner airline you cannot transfer them back. Always make sure you have a backup plan in case the award availability does not open for your date. To our dismay, the A380 was retired from the Tokyo to LAX route and replaced with a 777-300. With enough points already transferred to Singapore for the first class flight we decided that we would not let these flights go to waste. We then learned that instead of the A380, Singapore would be flying a brand new 777-300. Things could be worse, people. 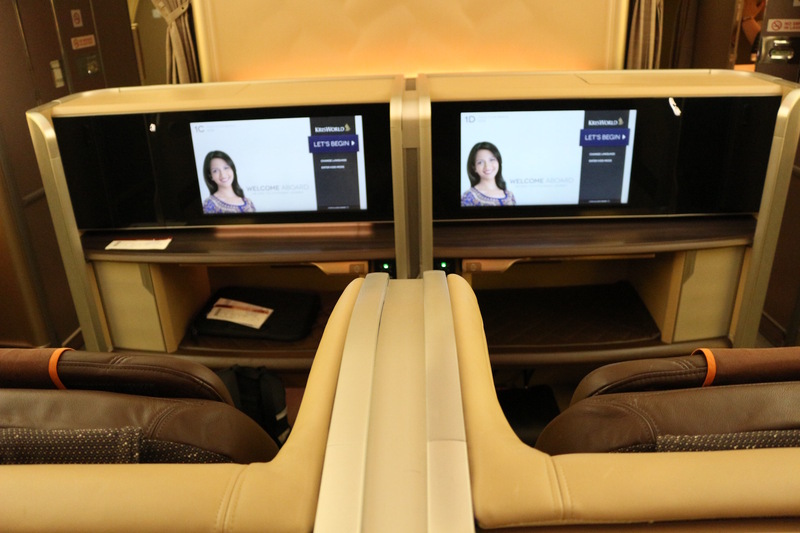 Singapore recently redesigned their First Class for this brand new plane. Nevertheless, we were very, very excited. Unfortunately, Singapore recently increased the amount of miles you’ll need to book their amazing premium cabin products. We were lucky enough to redeem our flight for 74,375 miles each. Currently the one-way first-saver award ticket runs for 95,000 miles each. 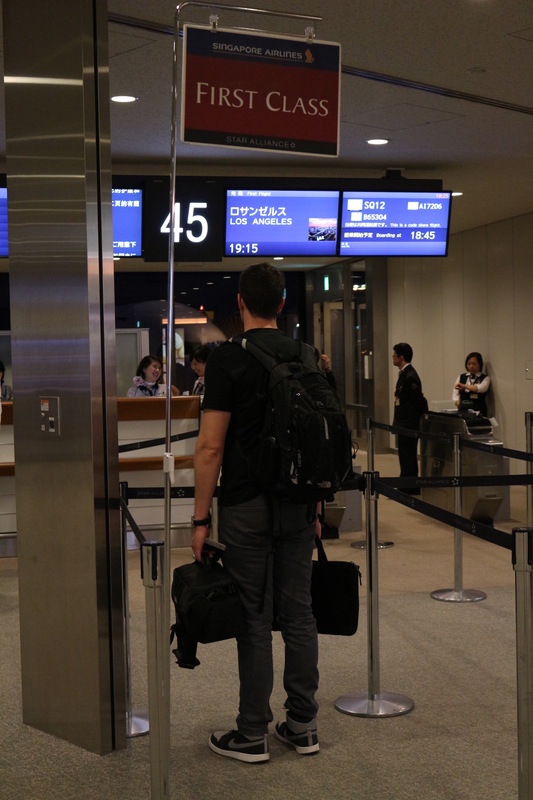 Singapore Airlines does not have a priority lounge at Tokyo’s Narita Airport. 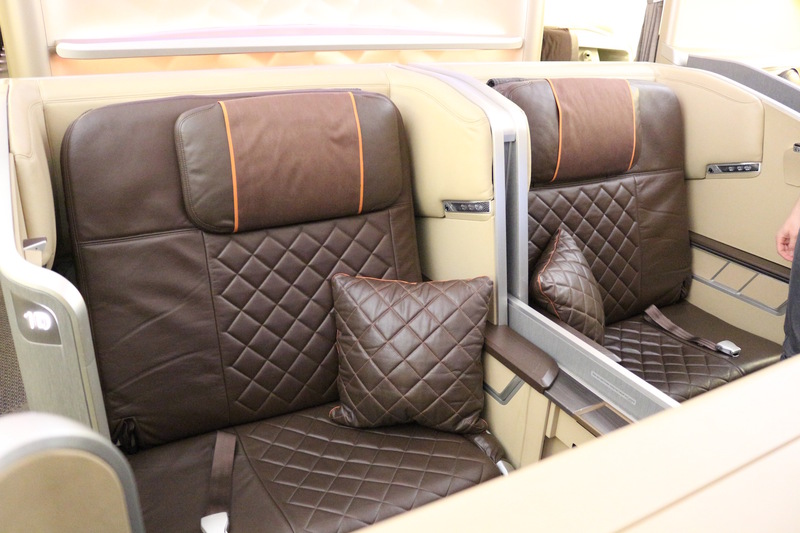 However, being that Singapore Airlines is a part of the Star Alliance, Singapore Business/First Class passengers are given access to United Airlines First Class Lounge as well as ANA’s First Class lounge. On our way to the ANA lounge, we decided to pop into the United Lounge. The United lounge was completely empty. There was a small spread of finger foods, as well as complimentary beverages including premium liquor, beer, wine and champagne. 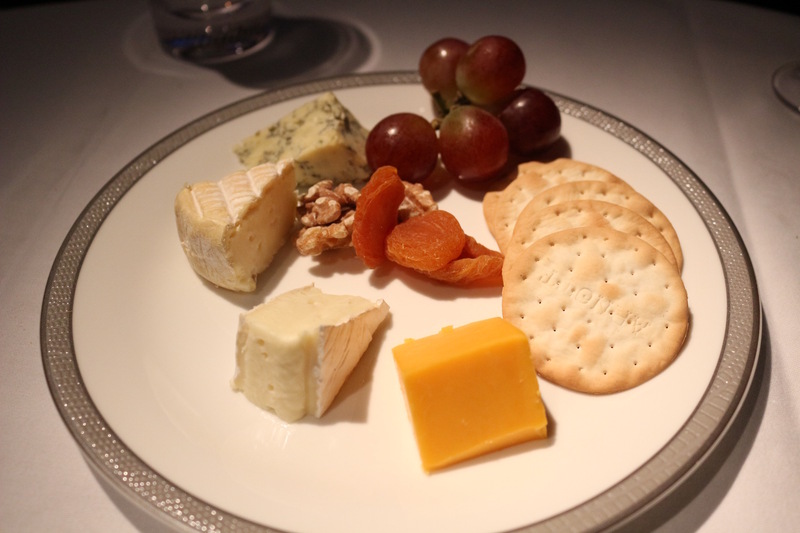 After a quick cheese plate and a glass of water, we made our way over to the ANA First Class Lounge. Being that we had been traveling all day, we opted to take advantage of the showers at ANA. I highly recommend making use of the showers. An amenity kit with soaps, shampoos, and conditioners a long with a fresh towel and an oversized shower will allow you to feel completely refreshed before the big flight. I gotta say, we were pretty crushed to learn that we would not be flying in the famous Singapore A380 First Class Suite. However, the brand new 777 did not disappoint. 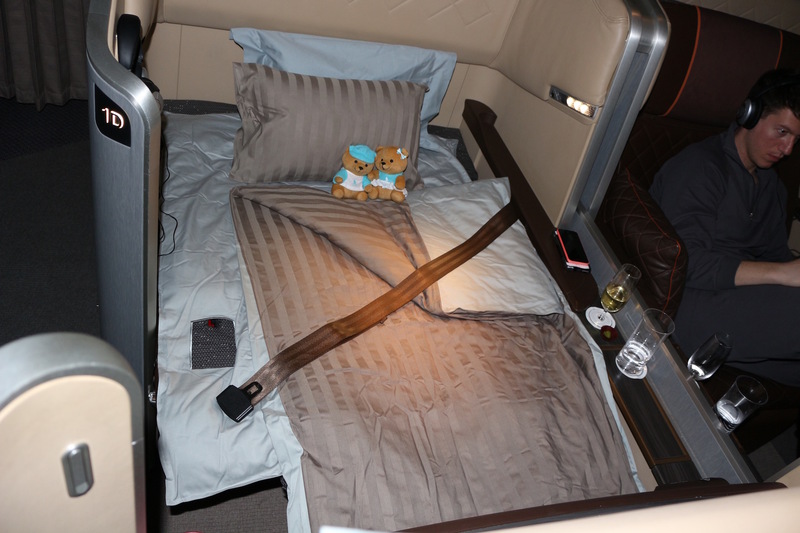 Although wifey and I did not have a private suite and we did not get to put our beds together, the new first class is still pretty “sweet.” See what I did there? Wait, we get the whole thing? 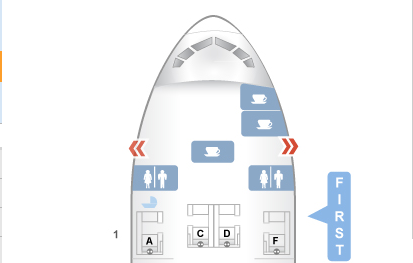 The configuration for the 777 is laid out in the customary 1-2-1 configuration. Being that there are only 4 first class seats, wifey and I obviously chose the 2 seats together, seats 1C and 1D. The first class cabin is small but mighty, with 2 bathrooms for 4 passengers. That’s an incredible passenger to bathroom ratio. Seriously people, 2 people can fit into one seat! The first class seats are literally ginormous! Picture a giant dark brown lazy-boy in the sky that’s double the width and comes with a private movie theater. The seat is big enough for 2 people to sit comfortably. According to SeatGuru this seat has an incredible 80 inches of pitch with 35 inches of width. If an airline were to try to encapsulate the “WOW” factor with a seat, Singapore definitely accomplished it with this one. I have literally never been so impressed with the amount of space on an airplane. Not to mention, the seat itself was insanely comfortable. Ever been waited on hand and foot before? Okay, we haven’t either. This must be what the celebs feel like. After boarding, our wonderful flight attendant, Jennifer, came to greet us. After getting comfy in our giant seats, Jennifer came with a bottle of Dom Perignon. 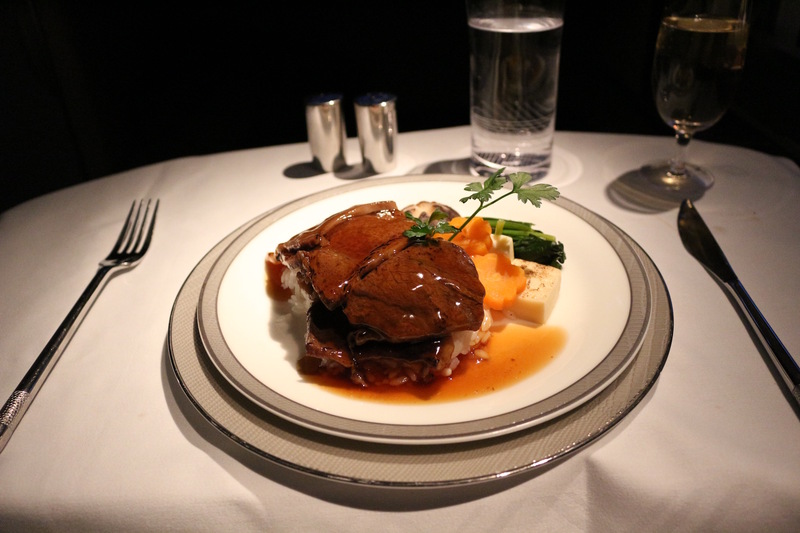 That’s right, there’s unlimited Dom Perignon included with your first-class experience. Jennifer also provided us an amenity kit with full size Ferragamo cologne/perfume and lotions. Just when we thought we couldn’t get any more comfortable, Jennifer came by with our Givenchy pajamas. Don’t adjust your screens, you’re reading that right. You get slippers and pajamas! 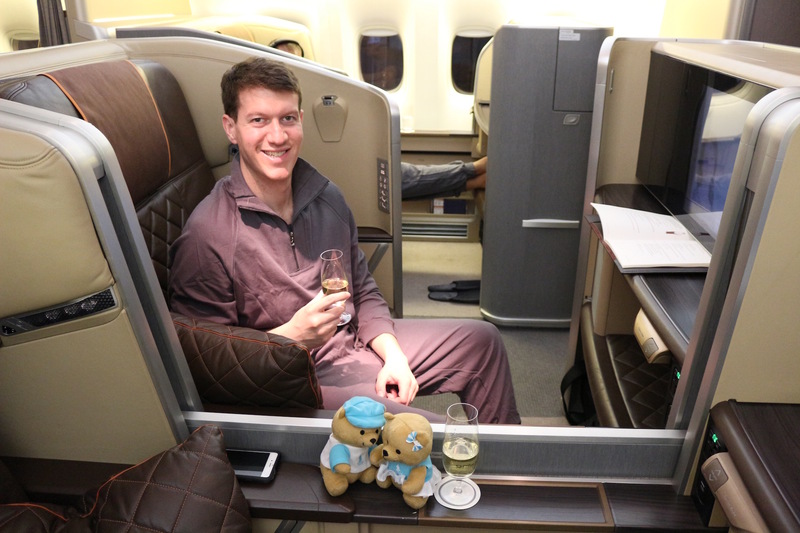 These pajamas were so soft and comfortable and just add to the over the top lavish experience you’ll feel while aboard Singapore. Jennifer, if you ever come across this blog, you were an absolute pleasure and I could not have asked for a better flight attendant. She even served as our personal photographer! Hearing nothing but amazing things about the food on Singapore, we couldn’t have been more excited once the meal service began. Since wifey and I did “book the cook”, our dinner entrees were pre-selected prior to the flight. 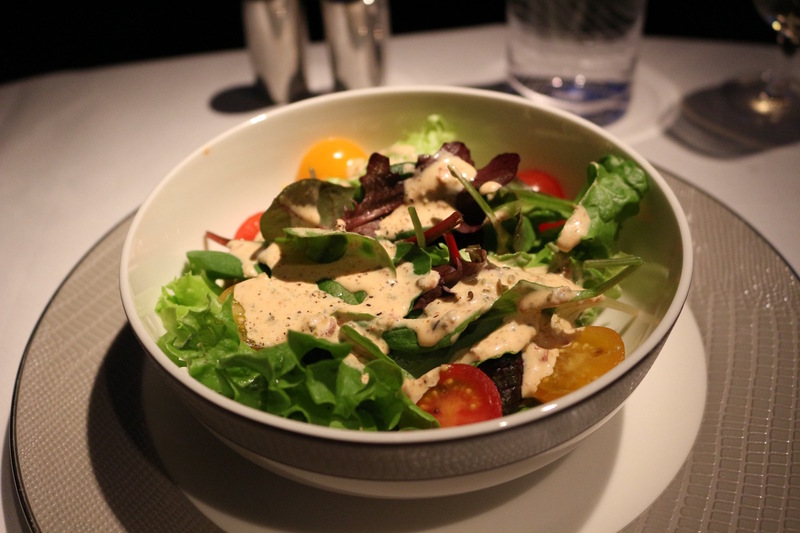 For an appetizer, we were served the airline’s famous chicken satay. 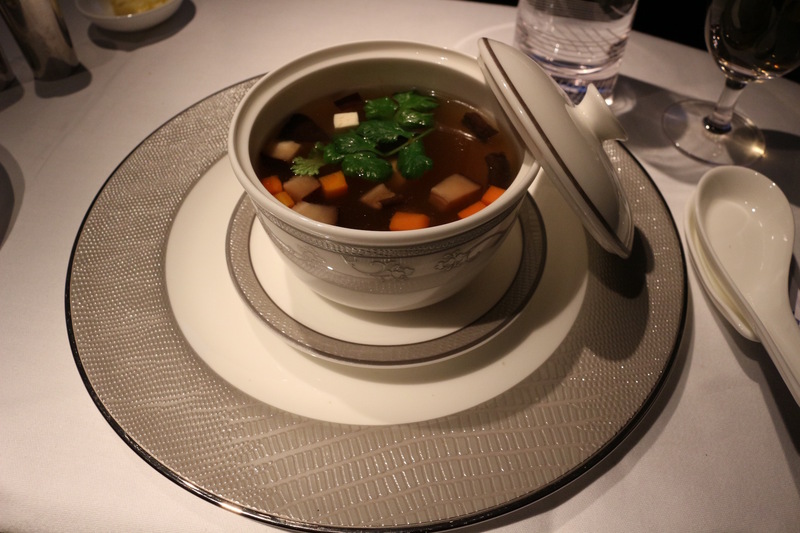 Oh before I forget, all meals in Singapore First Class are served on Givenchy china. Like I said, Singapore spares no expense when trying to WOW. 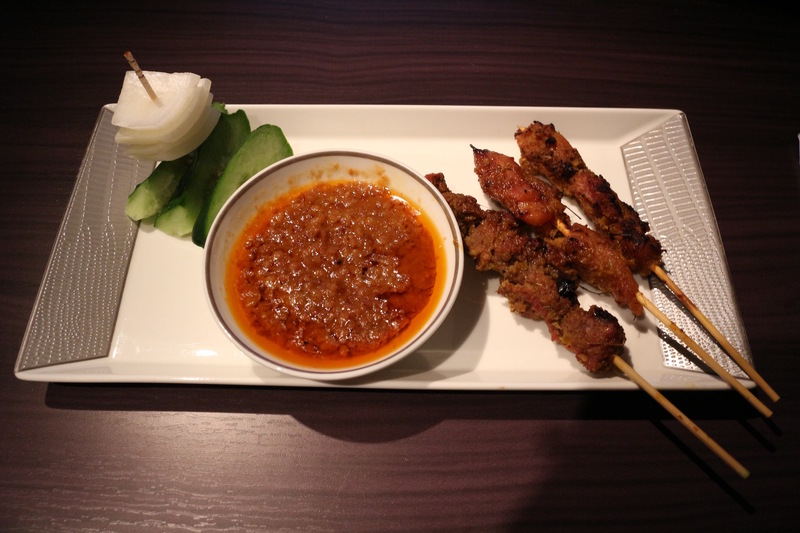 The chicken satay is accompanied by a yummy peanut sauce. The chicken was tender and juicy. I quickly ate all skewers and even finished my wife’s. Next, passengers will have the option to choose from caviar or lobster. I have never tried caviar before, and I love lobster so I went with the lobster tail. 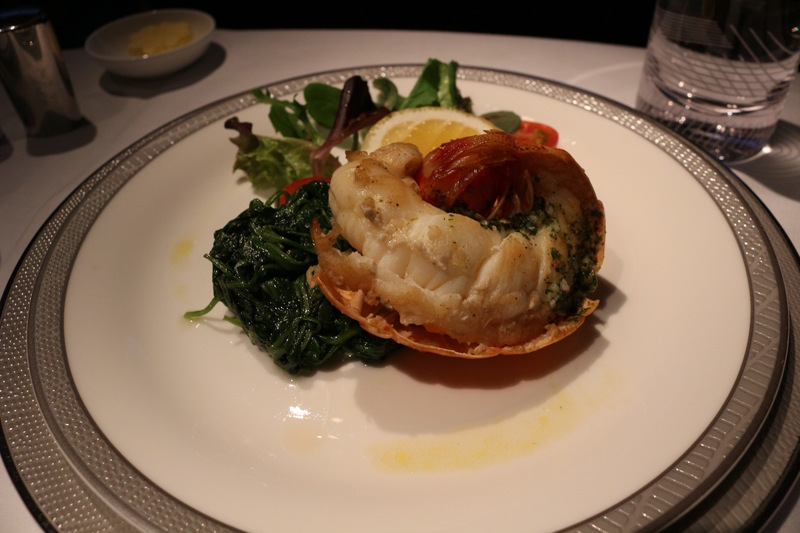 Again, the lobster tail did not disappoint despite being airline lobster. Before the entree we also got a salad and a soup. Both were nothing special but were certainly fun to try. For an entree, I decided to keep the Japanese theme going so I went with the Beef sukiyaki. The Beef sukiyaki was good, not great. The meat was flavorful, but a tad bit fatty. I was more than happy to surrender because I was already completely stuffed. 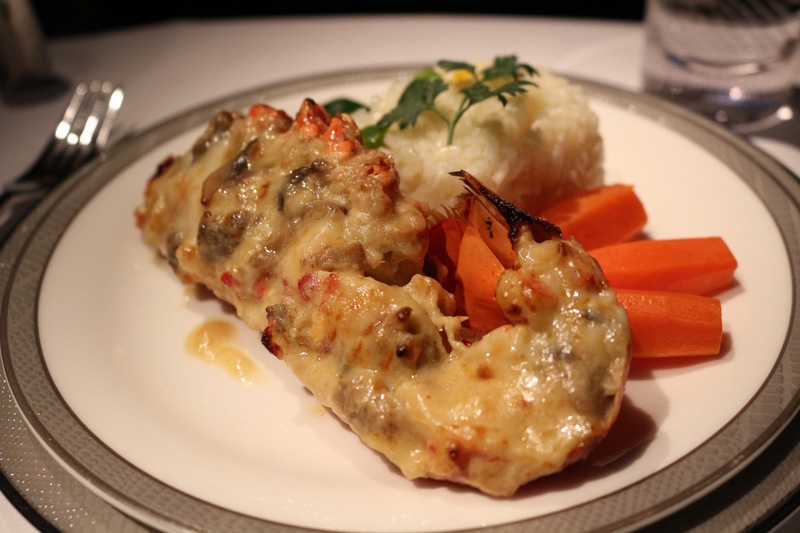 My wife ordered the lobster thermidor. This lobster tail was significantly bigger than the appetizer lobster tail and she absolutely loved it. There’s no such thing as death by overeating lobster, right? For dessert, my wife braved her way through the cheese plate. She just cannot turn down the opportunity for a well-stocked cheese plate. I mean, who can blame her? Throughout the meal service, Jennifer made sure our champagne and water glasses were filled to the brim. It’s so clear, it’s like she’s right there with me. The screen was truly the biggest I have ever seen for a personal seat on an airplane. Not only big, the screen was incredibly clear and came stocked with the latest HD movies, TV shows, games and even live TV. Each seat was also supplied with noise cancelling Bose headphones. After watching Rogue One, A Star Wars Story and eating dinner I was ready for bed. This is not just a seat people, its a legit bed! 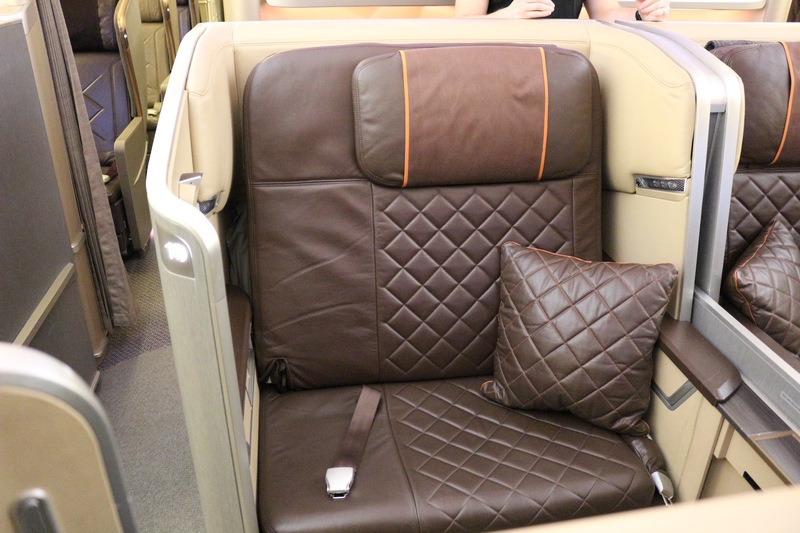 While most premium cabin lie-flat seats serve as your inflight bed, Singapore Airlines takes it a step further. The seat does not recline flat. Instead, Jenny, our flight attendant, came to make our bed. The seat flips over into a mattress. Jennifer then added sheets, pillows and a legitimate blanket to make up the bed. This was by far the most comfortable I have ever been on an airplane. The size of the seat transformed into the bed is akin to an oversized twin bed. Despite some rough patches of turbulence, I was able to sleep about 4 and a half hours. Had there not been any turbulence I could have easily slept the remainder of the flight. Now going back to my question in the beginning, its not hard to see why we were excited for an international flight. Had we paid for these tickets out of pocket it would have cost the two of us a whopping $19,000. Let that sink in for a sec. 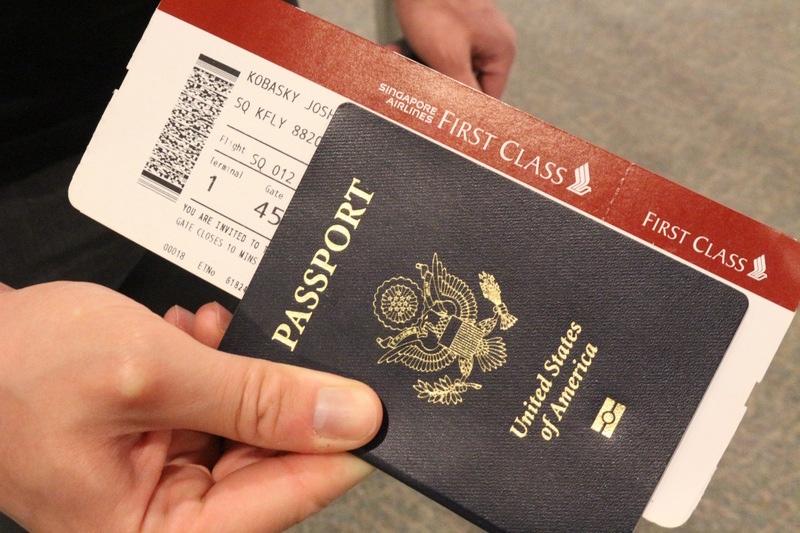 For tricks and tips on how to score free or cheap business class tickets, click here. The worst part of the flight, other than the turbulence, was that the pilot got good tailwinds and landed almost 2 hours early. 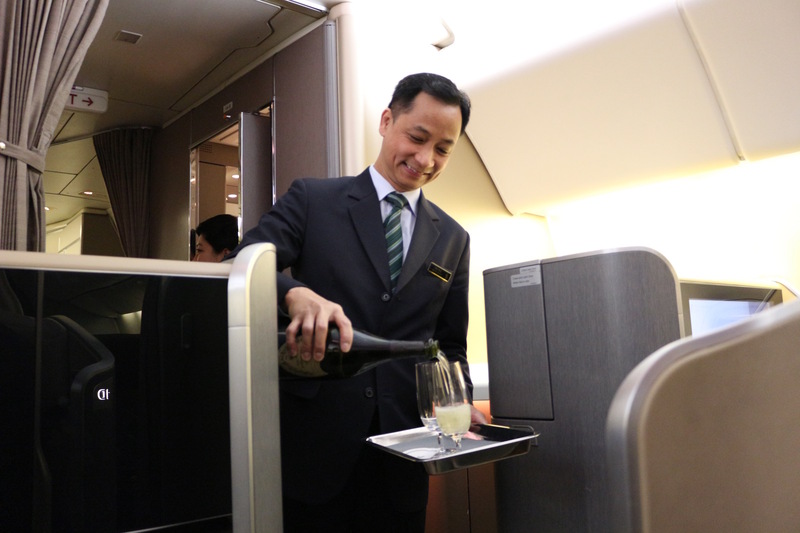 The service from top to bottom was impeccable and Singapore Airlines really went all out to ensure that their first class passengers would feel pampered throughout the entire experience. This was my first time flying first-class and I think it’s going to be a tough act to ever follow. 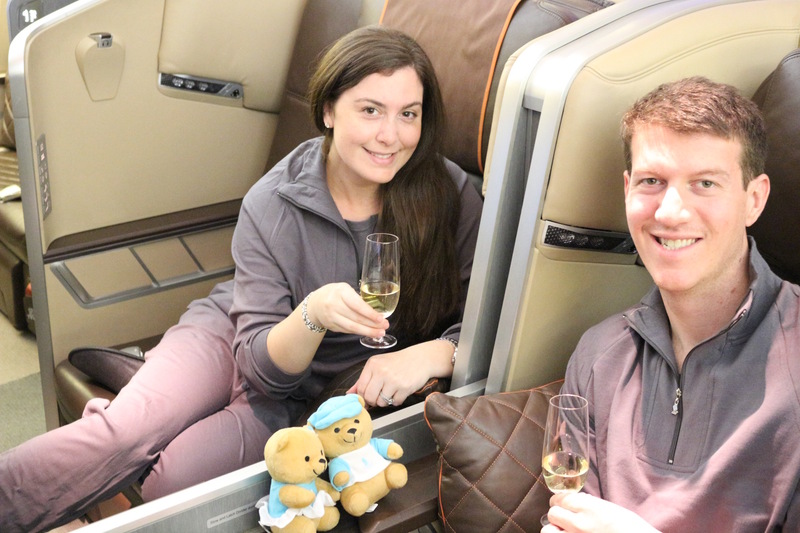 Ready to book your honeymoon in business class? Click here. Was just researching about the Boeing 777-300ER vs the A380 as we booked the same flight from Tokyo to LAX. This is going to be our first time trying First class so we’re really excited what the experience is like. Just curious, did you guys ever get to try flying F with the A380? I am just on the fence if I just save my 190,000 Krisflyer miles to use and book for the A380 or a Round The World Business/First class (though I will need to save more miles for this)! Thank you for the awesome blog post! You’re awesome! We unfortunately did not get to fly Singapore First on the A380. Originally, the A380 was the plane we were scheduled to take home from Tokyo to LAX, but they had switched the plane out about a month before we left. Hopefully, you’ll be able to tell us all about the first-class suite on the A380 one day.